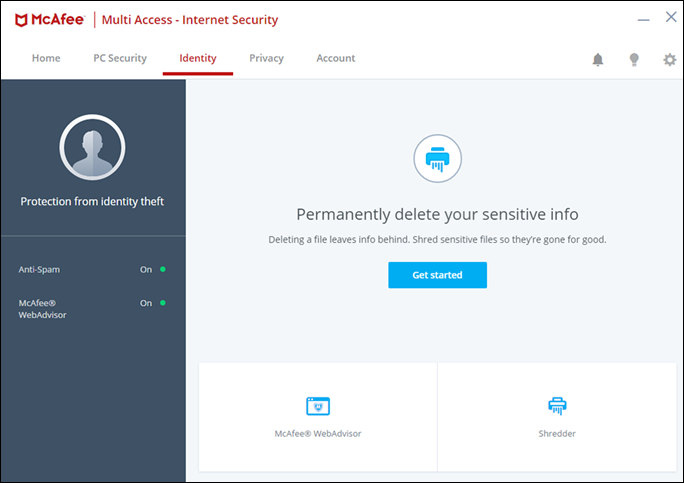 Learn how to install, use, troubleshoot, uninstall and deactivate Cox Security Suite Plus. 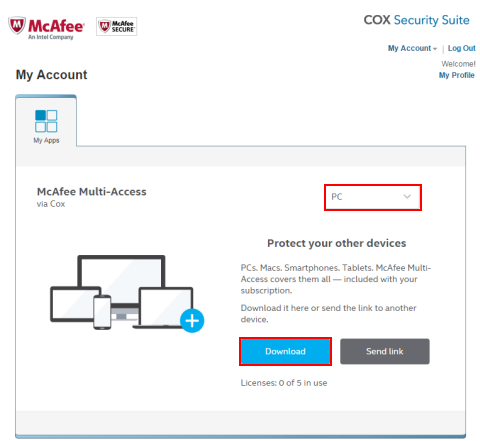 What is Cox Security Suite Plus powered by McAfee? 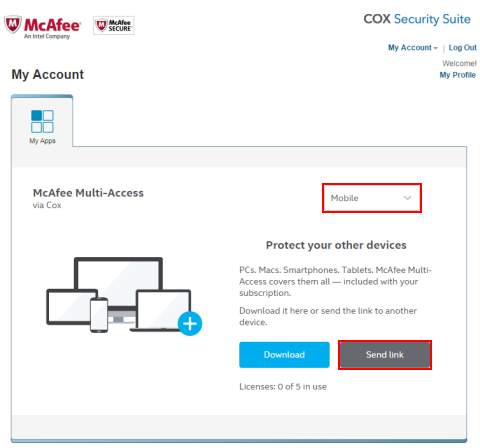 Cox Security Suite Plus is a free security software package backed by McAfee that is available to all Cox High Speed Internet customers. You can protect and manage up to five devices, in any combination of Windows or Mac OS X computers, Android smartphones and tablets, and Apple iOS iPhones and iPads. Cox Security Suite Plus offers the following security tools and features to help protect you and your devices while online. Before getting started, uninstall all existing security software from your device. Then, click the download button below (a separate window will open) and follow the instructions for your device type. You must use the Primary Account Holder's cox.com user ID and password. If a virus is discovered during the installation process, follow the prompts to remove it to proceed with installation. After installation, you may be prompted to reboot your computer. Step 1 Click here to start the download process. A separate window will open so that you can refer back to these steps at any time. Sign in with your Cox Primary User ID and Password. For more information, see Understanding Digital Identities and Account Types. 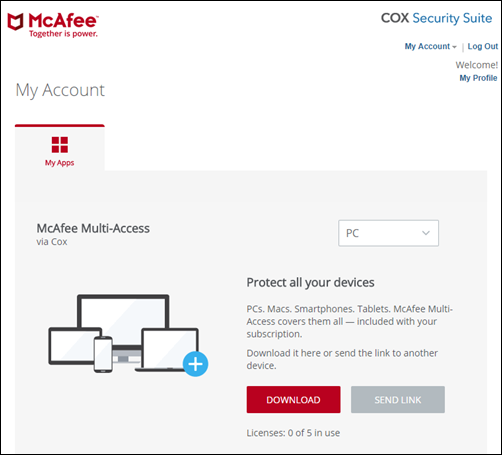 Note: When installing Cox Security Suite Plus for the first time, an activation page displays before redirecting to the McAfee My Account page. Result: Your personalized McAfee My Account page displays. 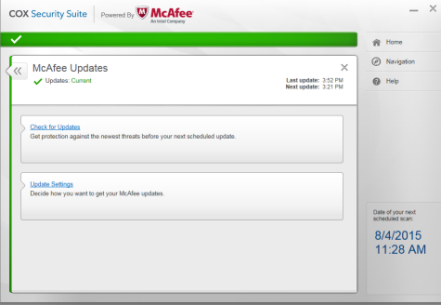 From the McAfee My Account page, select PC from the drop-down, then click Download. 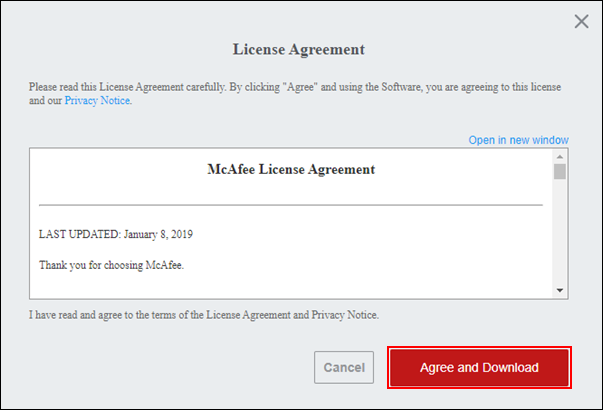 Click Agree and Download to confirm you have read and accepted the Intel Security (McAfee) License Agreement. Click Download and then click Save File. If you are using a non-Microsoft browser, make sure to save the serial number presented on the screen to use when prompted during the installation process. If the serial number is not used within two hours, you will need to restart this process. Step 6 On the Installer File pop-up window that displays, click Open. Select either Complete Install or Custom Install, then click Next. Custom Install allows you to select specific features if you do not want to install all features. A pop-up may display asking you to allow this program to make changes. Click Yes to allow these changes. Results: The download process begins. Once complete, your computer is protected. 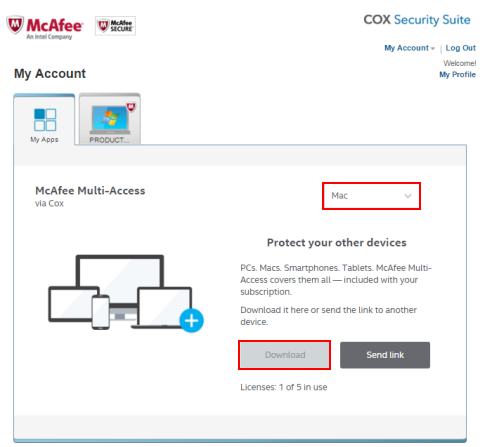 Note: When installing Cox Security Suite Plus for the first time, an activation page displays before redirecting to the McAfeee My Account page. 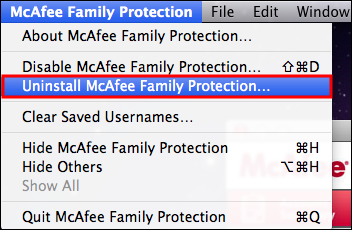 From the McAfee My Account page, select Mac from the drop-down, then click Download. Make sure to save the serial number presented on the screen to use when prompted during the installation process. Results: The MacAfeeMacinstaller pop-up window displays. Enter your Mac administrator Username and Password. Enter the serial number provided. Once the download is complete, click Finish. Result: A confirmation pop-up displays to install WebAdvisor. Select the desired option to complete your installation. Result: WebAdvisor is downloaded and installation is complete. We recommend that you begin this process on a computer. Click here to start the download process. A separate window will open so that you can refer back to these steps at any time. 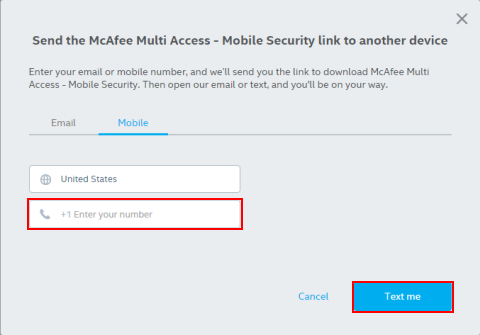 From the McAfee My Account page, select Mobile from the drop-down, then click Send Link. Choose one of the follwoing options to receive a download link and instructions for the device on which you want to install the software. On the Email tab, enter the email address and click Email me. On the Mobile tab, enter the mobile phone number and click Text me. On the confirmation window that displays to state the link has been sent, click OK. Select your device type and confirm the box next to the License Agreement is checked. 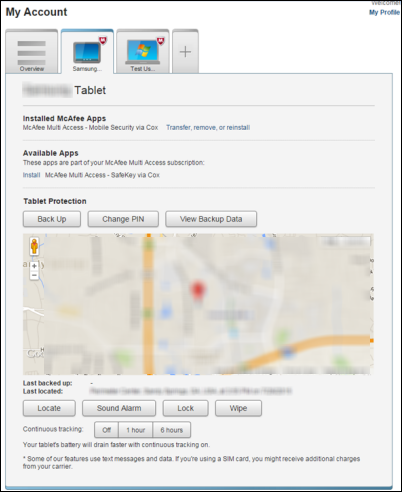 Result: The McAfee Mobile Security app displays in the Apple App store or Google Play store. Open the app and create a six-digit PIN. Important: This PIN is required to unlock or remove the app from the device. 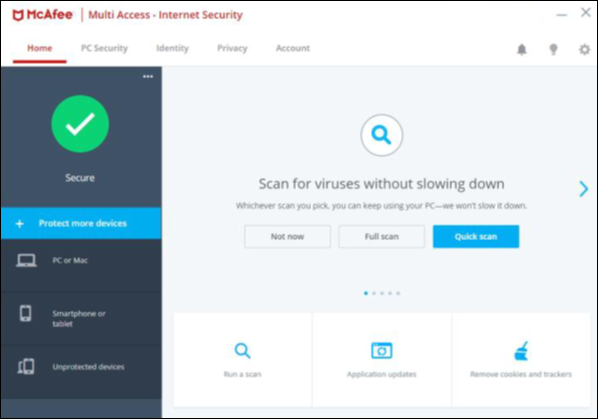 Cox Security Suite Plus includes all of McAfee's award-winning tools for virus, spyware, phishing, spam, and fraud protection. Get started by selecting one of the device types below. 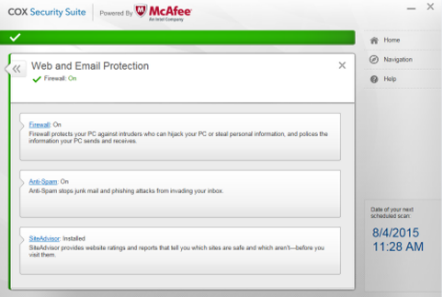 Visit the McAfee Community for additional help with any Cox Security Suite Plus feature. 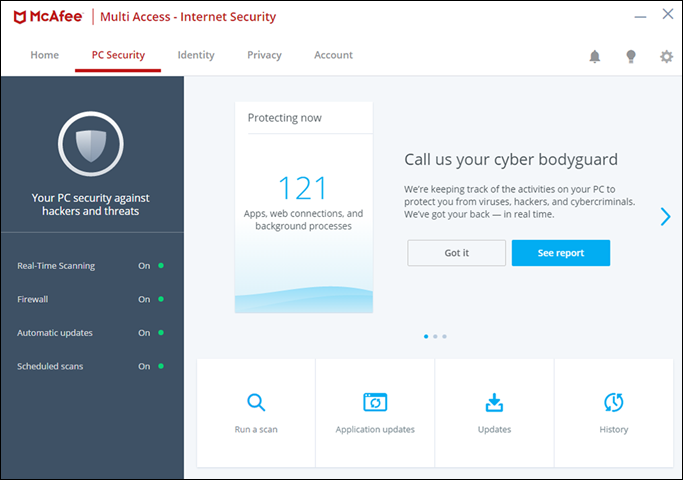 The Cox Security Suite Plus powered by McAfee software package includes all of McAfee's award-winning tools for virus, spyware, phishing, spam and fraud protection. Note: Visit the McAfee Community for additional help with any Cox Security Suite Plus feature. The McAfee My Account portal is accessed from www.cox.com/securitysuite. Note: Cox recommends deactivating a device license only in the event that the device is no longer working or not in your possession. Whenever possible, uninstall the software directly from the device. To open the Cox Security Suite Plus Console, double-click the McAfee icon from your desktop or the bottom right of the taskbar. Note: Click the Navigation tab on the right to see a list of all available features. See the table below to view the included options. Check for Updates - Cox Security Suite Plus checks and installs any updates. Update Settings - Select an option and then click Apply. Note: QuickClean improves the performance of your computer. Click Data Protection and then click Shredder. Click Parental Controls and manage any of the optional settings. Note: You must log in as the Mac administrator to make changes. Click ON or OFF next to the option you want to change. Click on the box next to the option you want to change. Note: Click Reset to return to the default settings. 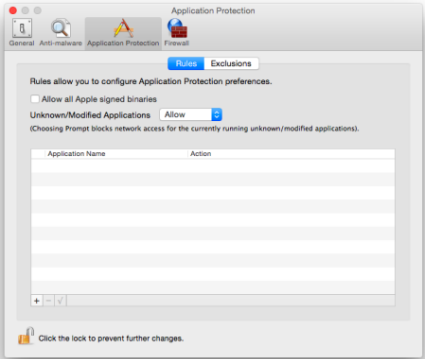 From the bottom left corner, click the + (plus) to add or - (minus) to remove preferences. 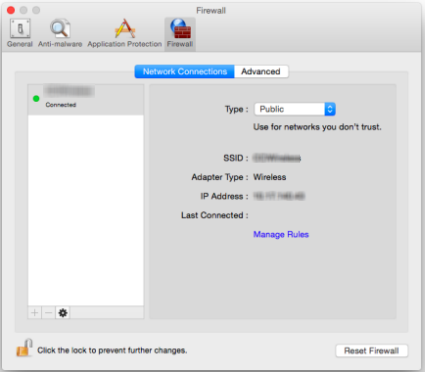 From the bottom left corner, click the + (plus) to add or - (minus) to remove network preferences. Note: Click Reset Firewall to return to default settings. 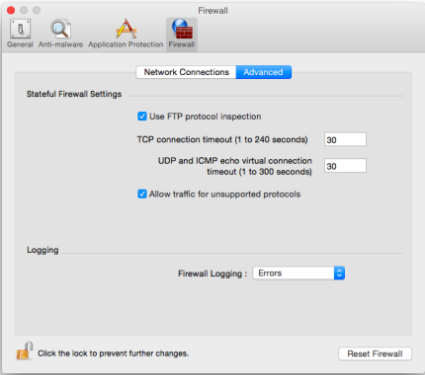 Make any changes to firewall and logging settings. McAfee Mobile Security is designed to protect and optimize your mobile devices. It helps keep your Android device safe from viruses and malware, while protecting your important personal information in the event it is lost or stolen. Open the Mobile Security app. Tap Scan now to scan apps. Result: The Security scan report screen displays. Review and take any recommended actions. Tap Update virus definitions to update virus security. Refer to the table below to manage the selected option. Review and take any recommended actions. Review risks and tap Trust to keep the app or Uninstall to remove it. 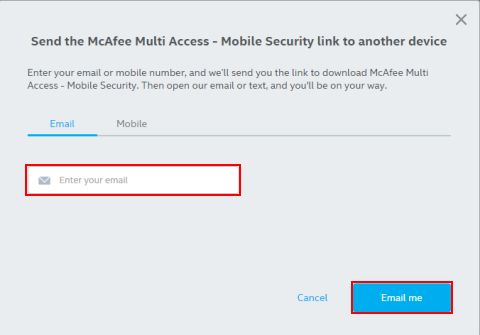 Enter your McAfee Mobile Security PIN and tap Continue. Tap the box next to each app. Note: Tap Select all for all apps. Note: Once locked, the app requires the PIN to open it. Tap the > (greater than sign) next to the profile to use. Tap the box next to each app to show for the profile. Tap the circle next to the profile to use. Access the Battery Optimizer from the notifications bar. Enter your PIN and then tap Enter. Choose a profile to access. Enter your PIN and then tap Continue.Note: Select Unrestricted to return to full access. Tap YesList to allow or NoList to block numbers. Tap Access Filter log to complete the following: View call logs, add calls to YesList or NoList, send text, remove from long. Optimize to improve power and performance. Tap Extend to extend battery life. Confirm or unselect features to manage and then tap Extend. 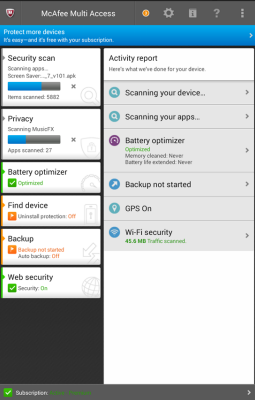 Review the active apps to free up memory. Go to www.cox.com/securitysuite and click Access Security Suite Plus. Sign in with your Cox primary User ID and Password. Click on the tab of the lost or stolen mobile device. Use the image below to specific options. To remove a specific threat, tap More Info to get more information on the threat then tap Remove. To remove all threats, tap Remove all. Tap Trust all to ignore the alert and keep the app. Tap Trust to keep the app. Tap Uninstall to remove the app. High Memory Usage - To lower memory usage. To close a specific app, tap the X on the app you want to close. Action - No action needed. From a computer, go to www.cox.com/securitysuite and click Access Security Suite Plus. Click on the tab of the device you are managing. 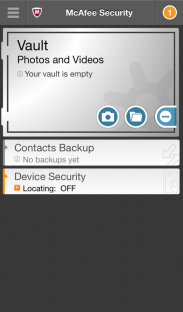 Open the McAfee app from your mobile device. Enter and re-enter the new PIN. Tap the option to turn Web Security and Wi-Fi Security off or on. Is there an Orange circle at the top of the app? Select and enter an answer for two security questions. Note: This option allows you to reset the PIN without an active Internet connection. Tap Set Your Security Question. Note: If the PIN does not work, tap Forgot PIN. You may need to change the PIN. Select and answer two security questions. Follow the steps to turn the widgets off or on. Tap the box next to Widget On / Widget Off to turn it off or on. McAfee Mobile Security is designed to protect your Apple iOS devices. It helps in protecting your important personal information in the event your iPad or iPhone is lost or stolen. Note: You may be prompted to allow the app to access to related features in your device. Tap Ok to allow. Updated intervals - change how often the device updates its location. S.O.S. - Saves location when the battery is low. Activate Alarm Test - Test the audible alarm for locating. McAfee Virtual Technician - McAfee scans your computer for any errors or issues preventing optimal performance. McAfee Knowledge Center with FAQs and search - Review FAQ’s and search for answers to common questions. If your issue is still not resolved after accessing these tools, contact us at 1-888-556-0959 for additional technical assistance with Cox Security Suite Plus powered by McAfee. Complete the uninstall process while your device is connected to the Internet if possible. Once the software is uninstalled, it will no longer display in the McAfee My Account portal. Get started by selecting your device type below. For help with previous versions of Windows, see Microsoft Support. In Search, enter Control Panel, then select Control Panel. 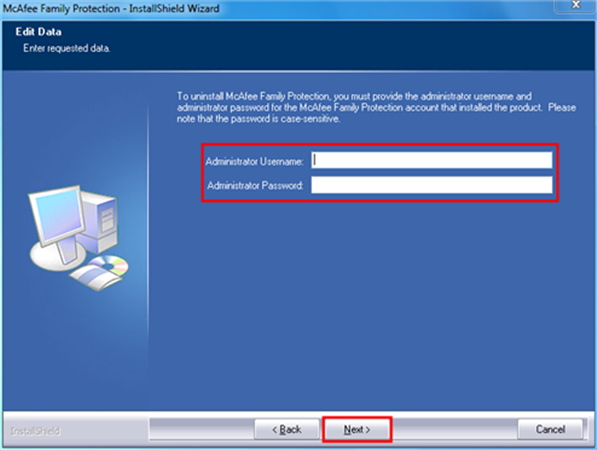 Select Programs > Programs and Features, then select McAfee Multi Access – Total Protection (PC). Follow prompts to complete uninstall. Note: If at any time you are prompted to remove shared files, answer Yes to all. Locate McAfee WebAdvisor in the list of installed programs, then click Uninstall. Note: You may be prompted to reboot your computer after uninstalling this software. From the Finder menu, click Go, then select Applications. 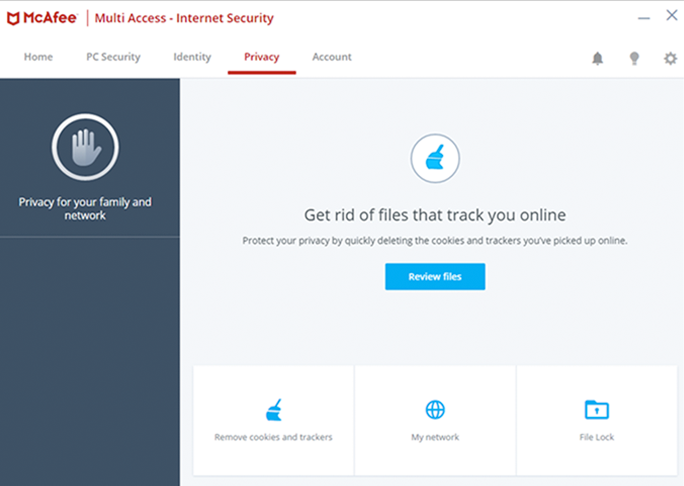 Double-click McAfee Multi Access - Internet Security Uninstaller. Result: The McAfee Uninstaller wizard displays. If installed, check the Uninstall WebAdvisor box, then click Continue. 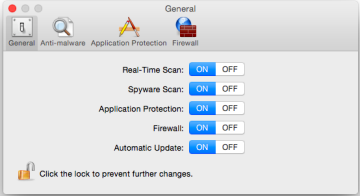 Note: When prompted, enter your Mac admin Username and Password and then click OK.
Press and hold on the McAfee Security icon until the icons wiggle. Tap the X located on the top right of the icon. Press the Home button to continue to use your device. From your device, go to your settings menu and select Location & Security. Open Device Administrator and unselect McAfee Mobile Security, then tap Deactivate. Note: You may be required to enter your McAfee PIN. Go back to the settings menu and access the Applications Manager or App Manager. Select McAfee Mobile Security and select Uninstall. Uninstall McAfee Mobile Security and restart the device. Need help with McAfee Family Protection? Effective July 19, 2018, McAfee discontinued support for McAfee Family Protection. Refer to the following instructions on how to remove McAfee Family Protection from all of your devices before December 1, 2018. 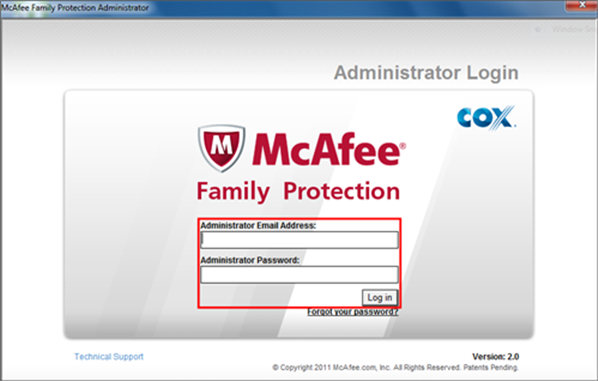 Enter your McAfee Family Protection Administrator Email Address and Password, then click Log In. Write down the uninstall code, then click the X to close the window. Note: The uninstall code expires at midnight. From the Start menu, select Control Panel or Settings / Control Panel. Double-click the Add/Remove Programs icon. 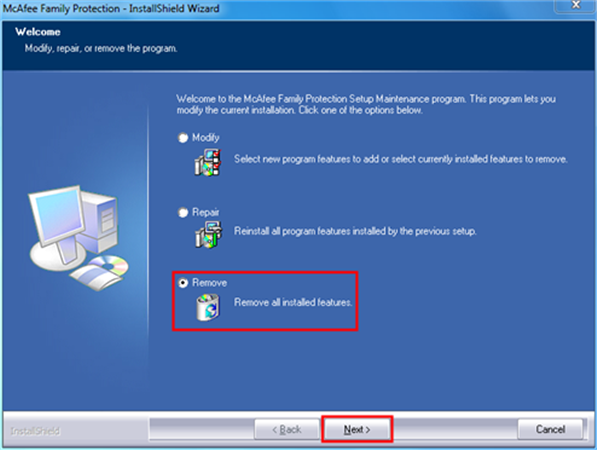 Vista Users: Under Programs, click Uninstall Programs. 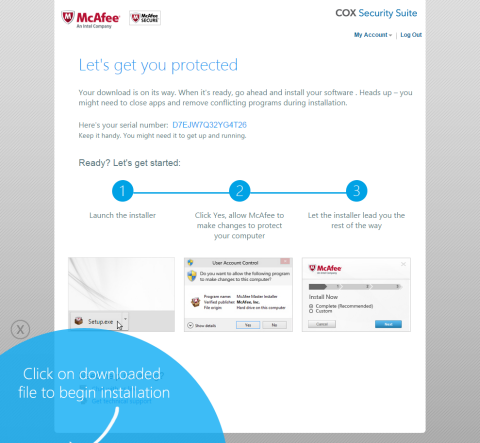 Click the McAfee program to remove, then click the Add/Remove or Uninstall button. If prompted to remove shared files, click Yes to All. 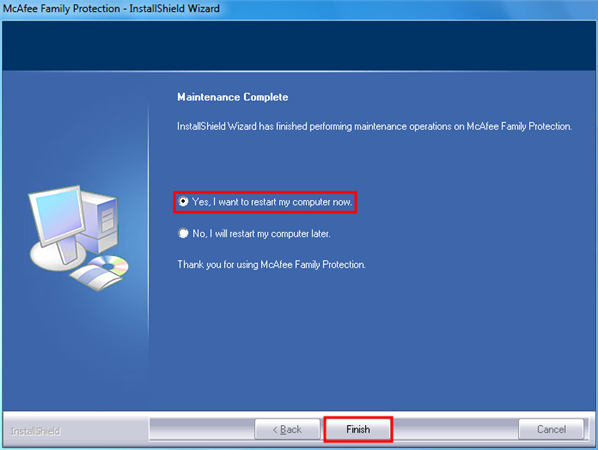 Result: The McAfee Family Protection - InstallShield Wizard launches. Select Remove, then click Next. 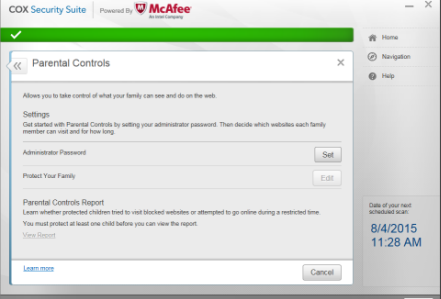 Enter your McAfee Family Protection Administrator Username and Password, then click Next. Enter your Uninstall Code, then click Next. Select Yes, I want to restart my computer now, then click Finish. 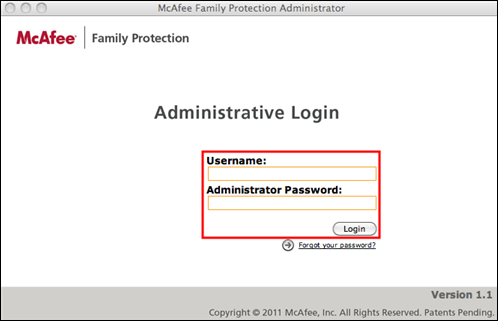 Enter your McAfee Family Protection Administrator Username and Password, then click Login. 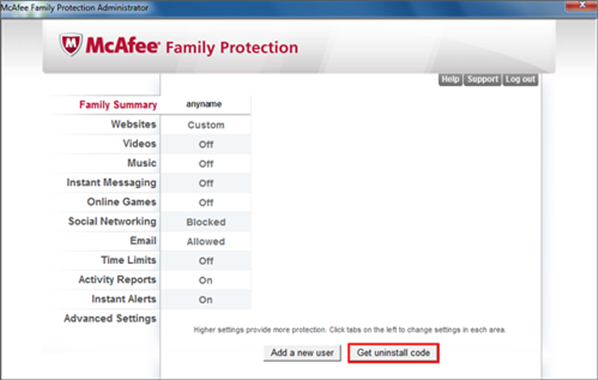 From the McAfee Family Protection menu, select Uninstall McAfee Family Protection. 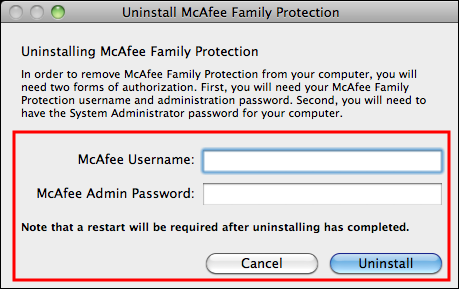 Enter your McAfee Family Protection Administrator Username and Password, then click Uninstall. 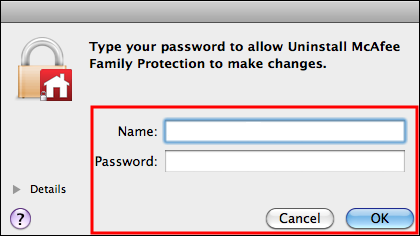 If prompted, enter your Mac admin Name and Password, then click OK.
Click OK to restart your Mac and complete the uninstall.